The opening night of Mixology Festival 2018: Circuit Breakers features an intimate celebration of the artist Jean-Jacques Perrey and the Ondioline, an early electronic keyboard instrument invented by Frenchman Georges Jenny, organized and performed by Australian pop artist Wally De Backer aka Gotye. Performed in the round, with direct sightlines into the intricate playing of the instrument, the program will offer a rare opportunity for fans of early electronic pop music to celebrate Perrey’s inventive studio work in a live environment. Jean-Jacques Perrey (1929-2016) was an alternative pop visionary, a pioneer of rhythmic tape editing techniques, and a virtuoso of the rare French electronic musical instrument, the Ondioline. Gotye, a long-time Perrey fan and a budding Ondiolinist, has assembled the Ondioline Orchestra, a new ensemble dedicated to reviving the spirit of this rare and unusually expressive early synthesizer. The ensemble features thereminist/keyboardist Rob Schwimmer, vintage synth specialist and ex-Psychedelic Furs member Joe McGinty, as well as members of acclaimed alternative band Zammuto. Perrey’s best-known songs will be celebrated alongside ultra rare pieces co-written with Angelo Badalamenti and Billy Goldenberg in an eclectic set juxtaposing Perrey’s joyful and boisterous pop with more reflective work spanning three decades of his career. 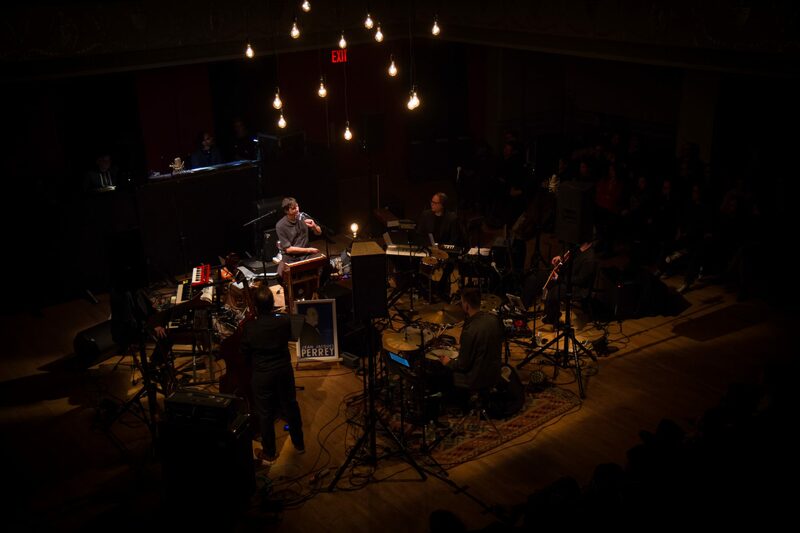 Ondioline Orchestra perform all sounds live, including Perrey’s signature sample sounds, classic Moog patches, and a rich variety of Ondioline timbres on fully-restored original instruments. Wally De Backer, better known by his stage name Gotye, has wandered many and varied paths in over 20 years making music. From playing drums and singing in Australian rock’n’rollin’ three-piece The Basics in places as far flung as Pannawonica, Western Australia and Shibuya, Japan, to writing, recording and releasing his first Gotye albums entirely independently (including hand-making the packaging for hundreds of individual records), he is happy to be described as “hands on” with his projects. In 2006, his self-released second album Like Drawing Blood was voted by influential Australian radio station Triple J’s listenership as its favorite longplayer of that year. In 2012 his album Making Mirrors won the Grammy Award for Best Alternative Album and the single from it, “Somebody That I Used To Know,” was awarded Record of the Year. Read our conversation with Wally in our zine.